In the picturesque village of Milopotamos follow the sign to “Neraida Waterfall”. The water drops from a height of about 20 meters and ends in a big pond. it will lead you to an idyllic site with tropical greenery, beautiful bridges, alleys and streams. This magical place is located within a glen -designated as of outstanding natural beauty- with rich poplar and plane trees vegetation. The “Neraida” or “Fonissa” waterfall is situated among huge plane trees and the sparkling waters falling from a height of 20 meters form a small green pond ideal for swimming. 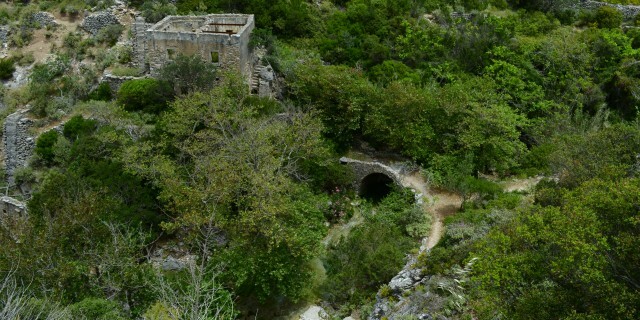 Walking around the waterfall you will find the abandoned watermills and more small lakes formed by the terrain. Be sure that the environment will charm you and take you back to the time of fairytales and myths. Shortly after you pass the waterfall of Fonissa among the plane trees and the ivy are the 22 watermills. The mills operated by water power from the river that still flows abundant. The water would run in a single trench that passed by all mills. Each watermill consisted of three main areas. The area where the mill was grinding the harvest, the room(s) where the workers would live and sleep and finally the space where they kept the donkeys, their means of transport at the time. The mills were owned by the families working there and they usually had the name of the constructors or of those who first operated them. The hardships of the millers’ and their families’ lives, along with the advent of new grinding tools led to the abandonment of the mills.